Mgosoft PDF tools is a professional PDF toolkit, it include pdf password remove, pdf encrypt, pdf split, pdf extract, pdf merge, pdf watermark etc. PDF watermark can help you stamp PDF with text, charts, page numbers, date and time, contact information, graphic lines and rectangles. PDF Password Remover can be used to remove the security on Adobe Acrobat PDF files. PDF Encrypt can help you set open passwords, preventing the PDF files from opening or reading. set owner passwords, preventing your PDF files from printing, editing, coping, and changing. PDF Merge is used to combine two or more PDF files into a single PDF file. 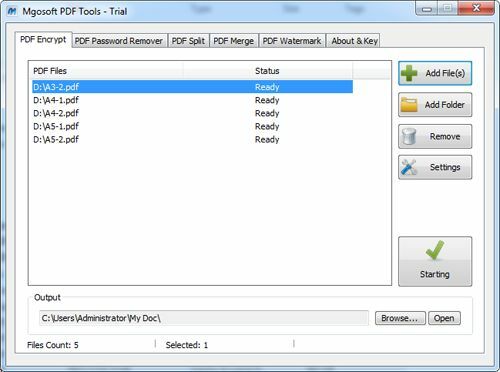 Set owner passwords to protect PDF from unauthorized editing, printing, and coping. Support 40-bit or 128-bit PDF encryption protection. Prevent printing PDF by unauthorized users. Prevent copying text or graphics of PDF. Prevent changing or editing contents of PDF. Merge PDF files according to the order of the files in the list box. Split a multi-page PDF file to single-page PDF files. Split a PDF file to multiple PDF files by every specified number of pages. Split the specified pages from a PDF file into a PDF file. Delete page or page range from PDF files. Apply text stamps to PDF with various effects. Support various fonts. Add text watermarks by using the standard Base 15 Fonts and Windows System Fonts. Support font style, font size, and text modes (solid/outline) settings. Support color settings: gray scale and RGB Color (0-255 RGB color values). Allow you to rotate the text stamps on any angle. Stamp PDF with graphic lines or rectangles. Specify a rotation angle degree for graphic lines or rectangles. Stamp multiple line stamps and other types of stamps on the PDF files at a time. Automatically fit the length of the line stamps to the PDF files. Automatically fit the length of the line stamps to the PDF files. Add stamps on the page header and page footer. Provide multiple position options, enabling you to put your stamp at the top, at the bottom, in the vertical center, at the diagonal-top left or at the diagonal-bottom left. Place the stamp on top of or underneath the original PDF contents.